Hostel Slow is situated in a quiet street in a Belgrade Touristic ambient zone. In the recently renovated house dates back from the beginning of the 20th century with a 600 m2 garden. Atypical place, really. More than a hostel. Hostel with a huge garden, an old house surrounded by trees in a quiet street and seems like in the countryside, but it ecological environments in the Touristic ambient zone of the Belgrade city, officially. Excellent location. Walking distance to the City and plenty of interesting places around. Churches, museums, parks, monuments, open markets, restorations, cafes, shops and many other exciting places to visit. 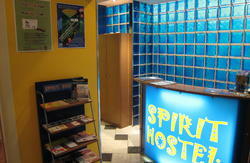 Unlike many other hostels in Europe, we have a lot of space. There are brand new single beds. In the yard there is a quiet coffee with our music, jazz, reggae. We have a large dining room, air conditioning. 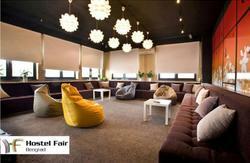 Hostel Slow is ideal place for seminars, meetings and conferences. 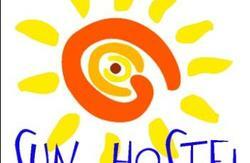 We offer you bed and breakfast or other possibilities to get a food. We have a chef Tucko and a powerful kitchen where the Chef can prepare whatever you ask or bring. At very fair prices. So you can count on that you will have a maximum of good cooperation with our chef. He is ready for any challenge. Rooms and bathrooms are clean, bright, and all the furniture is new, as well as mattresses and blankets. Towels are being changed every second day. We have a place to park your cars. Trolleys 19, 21, 22 and 29 and buses 83, 24 stops are 100 meters away. Trams (phone number hidden) have a stop couple hundreds meters away. Walking distance to the City center. Just tell us where you want to go, we can drive you by car. It is cheaper than taxi. Wi-fi internet works non stop. The house has been renovated in a classic original style with no plastic. Room prices are reasonable. Service is the great, stuff is friendly. Reception is open non-stop, 24/24, 7/7. One a car lot is free of charge for our guests. We have a video surveillance and a night guardsman. From the airport drive to exit the highway at Autokomanda. Than drive over the overpass and turn right at Juzni Bulevar st. At the second traffic light, turn left and drive uphill through Maxim Gorky st. Turn left into the fifth st. It is Dubljanska street and the hostel is on the right side, number 69. From the main railway and bus stations go by tram 2 or 9 to square Slavia. From the Slavia square go two stops by trolleybus 21, 22 or 29 to ÄŒuburski park. Go downhill ÄŒuburska Street and turn into the third street on your left. It is Dubljanska street and the hostel is on the left side, number 69.